There were two movie adaptations in the latter part of 2011 that our family was particularly excited about. The first, Hugo, based on Brian Selznick's The Invention of Hugo Cabret, was a lot of fun and has just garnered a bunch of well-deserved Oscar nominations. But we finally saw the second—the Steven Spielberg–Peter Jackson collaboration to bring Hergé's boy reporter Tintin to the screen—and it’s even more fun, and captures the feel of its source material better, too. The film takes its plot mainly from two sequential Tintin books from the 1940s, The Secret of the Unicorn and Red Rackham's Treasure, in which our hero helps his comrade Captain Haddock discover and recover a bountiful inheritance from a 17th-century ancestor. It also takes bits and pieces from other books in the series, most notably swiping the extended first encounter between Tintin and Haddock from The Crab with the Golden Claws (in the books, the pair are old chums by the time of The Secret of the Unicorn). Some characters who aren't in the Unicorn storyline at all show up here (Bianca Castafiore), while others who are in these books are kept up the filmmakers' sleeves, presumably for further cinematic adventures (Professor Calculus). Then again, this project was produced by Jackson, whose creation of the onscreen Gollum in the Lord of the Rings movies via motion-capture with the actor Andy Serkis (who plays Haddock in Tintin) was nothing short of revelatory. Plus, that same motion-capture technology was used for all the characters in the Tintin film, with the surroundings computer-generated around them. And the film's director was Spielberg, whose career has obviously cut a much broader swath in the years since, but who first made his name as one of the greatest action-adventure moviemakers of all time. So the adaptation was in good hands, at least. It shows. My first impression was that the filmmakers are long-standing Tintin fans who get, deep-down, what the books' fans love about them. Like them, the movie is an old-fashioned adventure story, in which we follow a likable, determinedly optimistic hero through a series of thrilling perils. (Hitchcock's The 39 Steps isn't a bad comparison, if you're looking for live-action ones, but it's a type they definitely don't make much anymore.) Also like the books, Tintin moves fast, from exotic locale to exotic locale and from action sequence to frenetic action sequence. Surprisingly, the many alterations from the plot of the two books didn't bother me at all, even though many are significant—Tintin and Haddock's not knowing each other at the start; the transposition of the antagonist's role from the nefarious Bird brothers (nowhere to be seen in the film) to the collector Sakharine (a completely innocent fellow victim of the Birds in the books). I think it's because Spielberg and the screenwriters establish so well that they get the source material that you're willing to go with the changes. Also, the changes work structurally; in some cases even I had to go back to the books to figure out exactly what they were. Before seeing it, I read some reviews of The Adventures of Tintin that complained about its impersonal nature and lack of depth (of the metaphorical, not 3-D, variety). Now, I find myself bewildered by those criticisms. There is a separation from the hyper-real in the film, certainly, but it's not as if the books' illustrations were exactly Gray's Anatomy either—just look at Tintin's iconic cowlick, for starters. And while there remains, even amid the increasingly lifelike qualities of cutting-edge CGI, an occasionally creepy sense that the "people" onscreen are, simply put, not living beings, I forgot about it pretty quickly once the story got going and pulled me in. Another complaint I read was from critics who wanted to know more of what these characters are about, what Tintin wants. Yes, Tintin is something of a cipher, on the page and onscreen as well, despite Jamie Bell's strong motion-capture and voice work. He's completely asexual—credit or blame the times of his creation if you like>—and his only "drive" seems to be to do good deeds and seek exciting new adventures. But certain kinds of stories aren't really about character, and I'm downright grateful that Spielberg didn't try to add new layers to the boy reporter. Backstory for Tintin would be as absurd as it would be for Rufus T. Firefly in Duck Soup. It's the supporting characters that have always been the lifeblood of the Tintin books, in terms of added dimension. And here they're fleshed out quite well by their creators, especially Serkis as Haddock (whom I'd never thought of as a Scot, but it works) and Daniel Craig, who portrays the bad guy with a versatility—there's an effete quality I certainly never associate with Craig's physical presence—I didn't know he was capable of. I can certainly see why someone who has always been able to take or leave the Tintin books might feel much the same way about the movie. But I think fans of the books will grin wildly all the way through it, as Dash and I did, and less partisan moviegoers (if my wife and our three-year-old are any indication) will have a pretty exhilarating time, too. • Great new albums from longtime favorites both superfamous (Dan Zanes) and more under the radar (Recess Monkey) have gotten almost daily requests since being acquired. And while veterans Brady Rymer, Key Wilde & Mr. Clarke, and the Hipwaders were already on our radar, each of their 2011 releases may have been their best yet in each case. • As usual, several artists known for their adult-oriented tunes delved into the kid genre last year. Our favorites were the sublime Songs from a Zulu Farm from Ladysmith Black Mambazo, and the (marvelously) ridiculous Down at the Zoo from Too Many Cookes (a.k.a. Mick Cooke of Belle and Sebastian). • Maybe best of all, we got to add a few bands and musicians we'd never heard before to our watch-for list in 2011. From Monty Harper's lyrical skill and factual accuracy (the only comparable kids' songs about science are from stratosphere-dwellers They Might Be Giants) to Papa Crow's gentle, soothing indie-folk sound, we were glad to meet them. 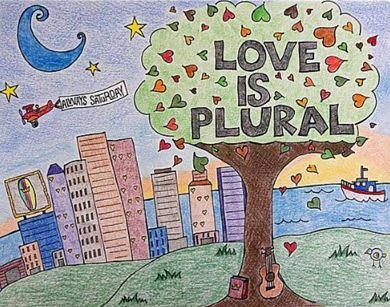 • Missed Coverage Subcategory: They got a vote from me in the Fids & Kamily Awards voting, but I never managed to actually post about Always Saturday’s excellent debut album, the double CD (one with stories, the other with individually corresponding songs) Love Is Plural. The 10 tracks of reggae- and calypso-tinged feelgood pop, reminiscent of the likes of Jack Johnson and Dave Matthews Band, are expertly produced to generate warm, calm feelings in kids and adults alike. And the stories (with the corresponding instrumental tracks playing underneath) match the music's tone exactly—good-humored, fun, smile-inducing. Just to explain the sudden complete lack of posting (as opposed to the slow posting of the last couple of months): I wanted to be sure the existence of this blog was OK with a new boss at the day job. Permission has now been reissued, and posts of a more prolific nature should be forthcoming, starting later today. My seven-year-old, Dash, spent a little less of his time reading graphic novels in 2011 than he had in 2010 (and a little more trying to create his own, thrillingly enough—more on that another time). But a few of them made enough of an impression to reach the top of his, and therefore this, list. It's no surprise that George O'Connor's Hera was first on the list; the initial book in his wonderful Olympians series of graphic novels was the subject of this blog's very first post ever. Even with our expectations sky-high for volume three, O'Connor managed to surpass them, taking a challenging and difficult mythological character and finding a way to spin her sympathetically. Like the first two volumes, Zeus and Athena, these get read over and over and over again. We're both really looking forward to seeing what he'll do with Hades, which comes out later this month. Dash's other favorite this year was a rare nonfiction graphic novel: Matt Phelan's Around the World, which tells the tales of three amazing 19th-century solo circumnavigations. I think the biggest challenge for Dash is differentiating it from the fiction—sometimes it's hard to believe that Nellie Bly, Thomas Stevens, and especially Joshua Slocum really, truly made these journeys. Regardless, Phelan makes it all a vivid, unforgettable read. But there's a third graphic novel, sort of, that I neglected to mention on the blog this year, though I meant to, and even thought I had. (That's kind of indicative of what 2011 was like overall, I'm afraid.) 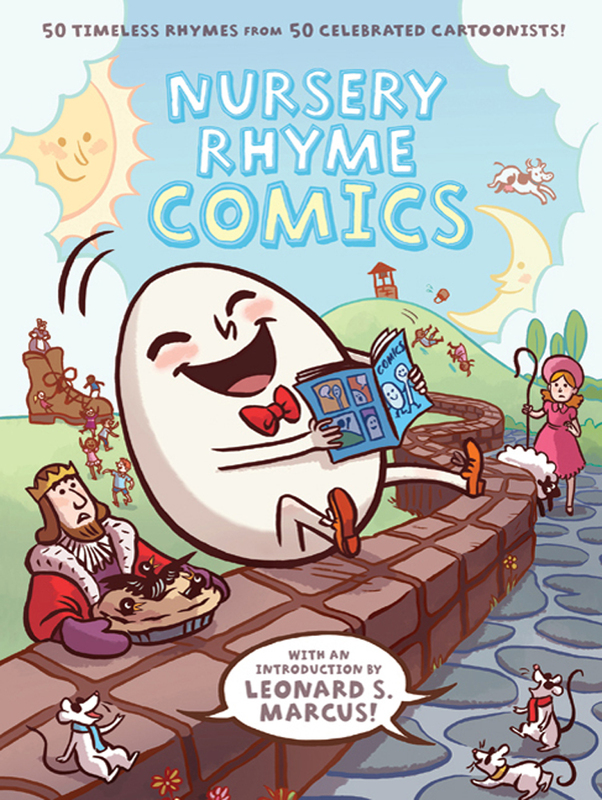 Nursery Rhyme Comics: 50 Timeless Rhymes from 50 Celebrated Cartoonists seems topical only for younger kids, by nature of its text. But its appeal is much broader, in fact, because each of these rhymes (some classic, some obscure) is illustrated—and really, more than that, its story told—by a different prominent artist, from Jules Feiffer ("Girls and Boys Come Out to Play") to the aforementioned George O'Connor ("For Want of a Nail") to David Macaulay ("London Bridge Is Falling Down," appropriately enough) to Gahan Wilson ("Itsy Bitsy Spider," again appropriately, and not so itsy bitsy) to Roz Chast ("There Was a Crooked Man"). Needless to say, the artists' takes on their respective rhymes are endlessly imaginative, and the book as a whole serves as a great example of how stories can be interpreted in an infinite number of ways. It's also a treasure as a sampler of so many of today's best active cartoonists, and neither Dash nor my three-year-old can get enough of it. Next wrap post: Our family's favorite chapter books of the year. 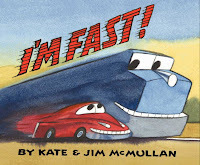 New Books: Trains Go/I'm Fast! And while it's merely days old, 2012 has already been a banner year for train books. Griff has two new bedside standbys, both actually the latest in larger, um, vehicular series. The first is the board book Trains Go, by Steve Light, whose vivid illustrations and suitably onomatopoeic text lead us through various train types—freight, old steam, new steam, diesel, the beloved caboose. Trains Go stands out among the many train-related board books on the market, and it instantly became a favorite. Griff has been asking for it in combination, of late, with Kate and Jim McMullan's I'm Fast!, the latest in their oeuvre that began with the garbage-truck saga I Stink! (another of Griff's faves, incidentally, especially in its Scholastic video version). This one recounts a race to Chicago between a freight train and a red sports car, both personified in the usual brightly aggressive McMullan manner. I'm generally of the opinion that blogging, like love for Harvard undergrads, means never having to say you're sorry, but I feel I really ought to apologize for the even-lighter-than-usual posting over the November and December holidays. The regular winter-holiday excuses apply, but are as always no real excuse, since it's not as if I didn't know they were coming. This category is led by one of my finalists for best children's book of the year overall (admittedly, I haven't gone beyond finalists yet), Jon Klassen's marvelous, ever-so-slightly shocking I Want My Hat Back, about a bear who really, really wants his lost hat back. Though come to think of it, I was no less enthusiastic about the brilliant concept and execution of Hervé Tullet's remarkable meta-interactive print book, Press Here, while Ido Vaginsky's Spin displayed actual interactivity of the clever paper-engineering kind. Rounding out the category were three sweet-clever titles. Both I and my three-year-old vacillate daily on which of them we love most, so I'll list them in alphabetical order to avoid false momentary favoritism. (And truly, we love them all equally.) Edwin Speaks Up, by April Stevens and the beloved-of-this blog Sophie Blackall, struck a chord with all toddlers who know they're the only sensible people in the family. In her Hopper and Wilson, Maria Van Lieshout channeled the warmth and poignance of A. A. Milne. And Diane Kredensor's Ollie & Moon combined illustrations with Sandra Kress's photography in a charming, evocative, and, yes, clever way. 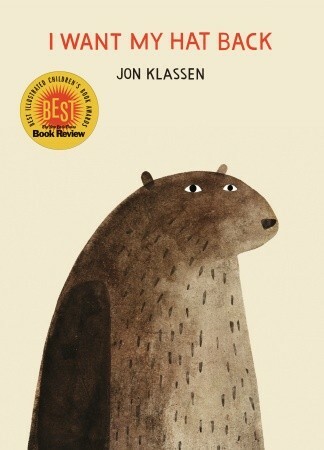 In my next 2011 wrap-up post (i.e., my post after next), I'll look at the year's top graphic-novels for kids, including a fantastic compilation I forgot to write about first time around.